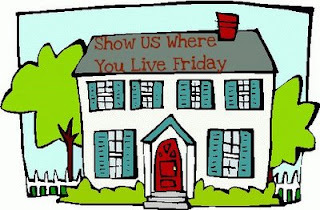 It's Show Us Where You Live Friday - Living Room edition, sponsored by Kelly! We're fairly simple people and tend to like the easier side of life. That being said, I do not have a spotless house, I *sometimes* spot dust bunnies running across the floor, and I certainly wouldn't change a thing! So sit back, relax and enjoy! 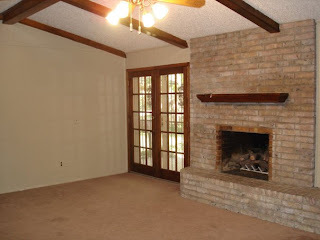 Here's the living room when we bought the house.... painted wood paneling and pink carpet! And here are the after pic's! Much better! I've also included pictures of our basement. We use it the same as our living room! However, we also use it as our theater (the big screen & projector came with the house), office, play the Wii room, and my "craft" room! So it has many purposes! Shout out to my aunt Diane whose birthday is tomorrow! To my cousin Josh for his graduation tomorrow! And to Diane, Craig, Kim & Mark - Landry CANNOT wait to see y'all! love your ceiling beams & old school desk! Love your hardwood floors upstairs and your home theater!!! We used to have one in a former home and really miss it. we have a deerhead too! lol. the after pics are MUCH better :) i love before and after pics!